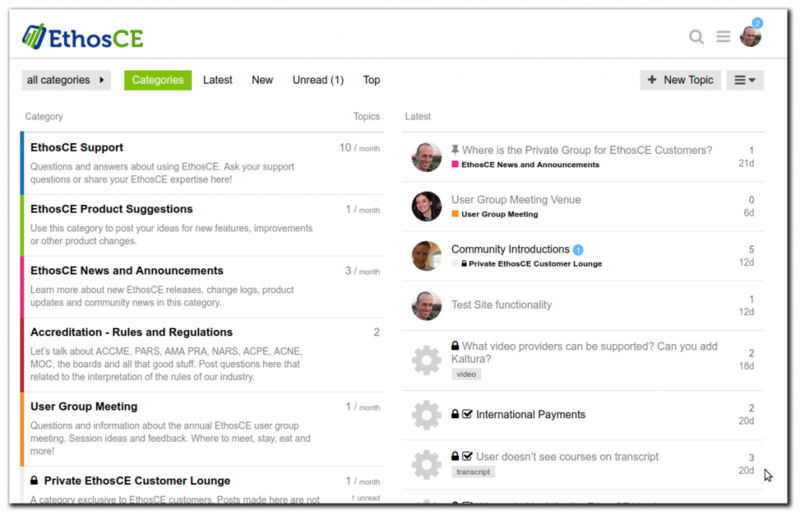 Today we are very excited to announce the launch of the EthosCE Support Community. The community will be the primary way we receive, discuss and evaluate the popularity of product features and feedback from our customers, so if you have product feedback or suggestions, please post them in the community. The EthosCE Support Community also houses a private group for EthosCE customers as well. Should I post my support issues to the community or open a support ticket? If your question is of a general nature, please post it to the community. It may help others with the same issue. However, if the issue is specific to one of your courses, configurations or customizations, please open a support ticket within JIRA as you do now. As a rule of thumb, if the issue requires posting a URL from your site, you should probably open a support ticket. All DSOs and trained EthosCE users should receive an invite via email. If you didn’t receive an invite, just visit https://community.ethosce.com/ and create an account. We invite any non-DSO admin users to join our community as well, just follow the link above. What should I do after I create an account? Send us a private message via the online community and let us know you’re here. Just look for a staff member, click their name and then click “Message” to send us a note. We’ll add you to the EthosCE customer group. Then go to the EthosCE private lounge and introduce yourself. Yes and no. We have a private group for EthosCE customers only. If you would like to keep your messages private to just our customer-only community, free free to use the private group. Posts made in any other area of the site are public. How can I enable/disable email notifications?